In Apopka, Florida we can appraise single family homes, condos, condominiums, vacant land, houses, manufactured homes, mobile homes and modular homes. Have An Apopka Appraisal Question ? Call Now ! 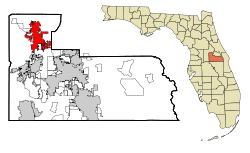 The City of Apopka was incorporated in 1882. The City limits were originally measured one mile in 1 mile increments from the Masonic Lodge. The "Lodge" is still there and still in use. Apoka is the home of the "fern"